Before :- G.R. Luthra, J. For the Petitioners :- Mr. K.K. Sud with Mr. Rajiv Chauhan Advocate & Mr. K.K. Rai, Advocate and Mr. A.K. Bajpai, Advocate. For the Respondent :- Mr. Swatantar Kumar, Advocate with Ms. Geeta Mittal, Advocate. A. Dowry Prohibition Act, 1961, Section 4 - Indian Penal Code, Section 498A - Demand of dowry and harassment - A person demanding dowry can both be prosecuted under Section 498A IPC as also under Section 4 of Dowry Prohibition Act simultaneously - Doctrine of double jeopardy is not applicable - Section 498A is not ultra vires the Constitution. Section 498A IPC does not create any situation of double jeopardy. That provision is distinguishable from Section 4 of the Dowry Prohibition Act because in the latter mere demand of dowry is punishable and existence of Element of cruelty is not necessary. Section 498A IPC deals with aggravated form of the offence. It, inter alia, punishes such demands of property or valuable security from the wife of her relative as are coupled offences punishable under section 4 of the Dowry Prohibition Act and section 498A IPC. It is just a case similar to section 5(2) of the Prevention of Corruption Act and section 409 IPC even if the accused had been acquitted of an offence under section 5(2) of the Prevention of Corruption Act and that Article 20(2) of the Constitution had no application. It may be mentioned that the said provision of the Constitution says that no person shall be prosecuted and punished for the same offence more than one. B. Indian Penal Code, Section 498A (as amended on 25.12.1983 by Criminal Law Second Amendment 1983) - Allegations made in the complaint regarding demand of Dowry and harassment pertained to period prior to coming into force Section 498A - Complaint maintained on facts of the case. Smt. Nagawwa v. Veeranna Shivalingappa Konjalgi, AIR 1976 SC 1947 (1976 Suppl. SCR 123). L.V. Jadhav v. Shankarrao Abasahad, 1983(2) RCR(Crl.) 400 (SC) : AIR 1983 S.C. 1219. Pratibha Rani v. Suraj Kumar, 1985(1) RCR(Crl.) 539 (SC) : AIR 1985 SC 628. State of Madhya Pradhesh v. Veerashwar Rao Agnihotri, AIR 1957 SC 592. Thakur Ram v. State of Bihar, AIR 1966 SC 911. G.R. Luthra, J. - By way of this judgment, two petitions and two criminal misc. (Main) 979/85 was filed by Inder Raj Malik and three others against an order of Shri R.K. Jain, Metropolitan magistrate, New Delhi. The order was passed on a complaint of Smt. 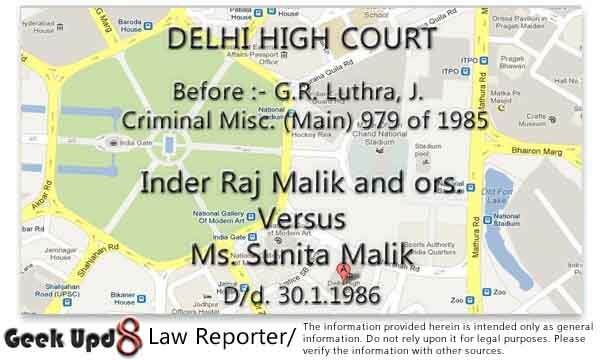 Sunita Malik (hereinafter referred to as the complainant). Vide the aforesaid order, the learned magistrate directed the summoning of the petitioners (herein after referred to as the accused) in respect of commission of an offence punishable under section 498A IPC and also summoning accused No. 1 and 2 in respect of commission of an offence punishable under section 406 IPC. The other petition being Criminal Misc. (Main) 1222/85 was filed by the complainant. Her grievance is that all the accused should have been summoned in respect of commission of the offences punishable under section 406 and 327 read with section 109 IPC, in addition to summoning under sections 498A IPC. Therefore, she prays that all the accused should be directed to be summoned accordingly. 2. Criminal Misc. Nos. 2155 and 2230 of 1985 are connected with Criminal Misc. (Main) 979 of 1985. The judgment is being written in the file of Criminal Misc. (Main) 979/85. 3. The complainant and Inder Raj malik, accused No. 1, were married on 8th February 1981. Accused No. 2 is the mother and accused Nos. 3 and 4 are the Brothers of Inder Raj malik, accused No. 1. 4. For the purpose of deciding both the petitions as well as the criminal misc. applications, it is necessary to know as to what allegations are contained in the complaint and what preliminary evidence had been produced before the learned magistrate. The allegations in the complaint filed by the complainant are briefly as follows: The accused are greedy people. They were interested in having a huge dowry. They started making demands. Originally, the marriage was arranged to be celebrated in Clabridges Hotel. At the instance of the accused, the venue was shifted to Taj Hotel which meant higher expenses for the parents of the complainant. 5. With a view to extort more and more money and articles, the complainant after marriage was mal-treated, beaten, starved and abused. The parents of the complainant went on meeting some of the demands. The aforesaid mal-treatment and beating was specially done on the festivals. On 19th February 1982, she was tortured mentally and physically to the extent that she fainted in her matrimonial home, yet no doctor was consulted. The parents of the complainant wanted to take her to the parental home but the accused did not allow. She was ultimately taken to the parents home on 20th February 1982. She was pregnant and gave birth to a child on 25th August 1982. Not only that she was not looked after by any of the accused and had to be looked after by her parents none of the accused came to see her. The delivery took place at Sehgal Nursing Home. The atrocities of the accused went on. At one point of time, accused Nos. 2 and 4 came to her parental home and threatened to kill her and forcibly take away the child. She was also given threats on telephone from time to time by the accused jointly and severally. The threats were that her child would be taken away unless she forced her parents to sell their property at Hauz Qazi and gave the money to the accused. Lastly these threats were repeated in December, 1984. 6. Large amount of jewellery and other gifts were given to the complainant by her parents as well as others relatives. A list was attached with the complaint. Those constituted Satridhan. They were lying at the matrimonial home and the accused refuse to hand over the same to her inspite of demands. Some of the articles have been sold. 7. The complainant examined three witnesses besides appearing as her own witness. She as PW1 has supported the entire version given in her complaint. She stated that the carbon copy of the list given at the time of marriage and subsequently demanded by her father-in-law was Ex. PW1/A. She added that on each and every festival, her mother-in-law used to harass, even pulled her hair and made demands to the effect that she should call upon her parents to send gifts for every one and the list of such demands was Ex. PW1/B. 8. While concluding her statement, the complainant expressed the fear that her son might be taken away and even killed by the accused because she was continuously receiving threats and abuses on the telephone from accused Nos. 1 and 3. 9. Smt. Phula Rani (PW2) is the sister of father of the complainant. She stated that on 17th February, 1982 she went to invite the complainant for attending the marriage of son of the former but that not only the accused Nos. 2 and 4 turned down her request to deliver the invitation card, but she was not even allowed to talk to the complainant with the result that neither the complainant nor any of the accused attended the said marriage. 10. Mrs. Swaran Sharma (PW3) lives in the neighbourhood of the parental home of the complainant. She narrated as to how with great pomp and show and expense the betrothal ceremony and marriage of the complainant took place and as to how lot of dowry as well as articles demanded by the accused were given. She also narrated that the complainant was brought in just wearing apparels with a very bad state of health on 20th February 1982 by her father and that on 21st February, 1982, the accused forced their entry into the parental house of the complainant, abused her, her parents and threatened that they would kill the complainant. Her statement further is that on 2nd September, 1982, the accused gave threats and used abusive language for the complainant. Then she narrated about an incident for 19th August, 1983 as to how a person forcibly entered into the parental house of the complainant and wanted to take away her child but he was apprehended by the neighbours including her (PW3). 11. Jeewan Sarin (PW4) is father of the complainant. He also supported the allegations contained in the complaint. He further stated that the accused were continuously threatening on telephone and that in December 1984 they demanded that they must be provided with a sum of Rs. 2,00,000/- by way of selling his house because they needed the same in connection with the marriage of accused No. 3. 12. The accused (now petitioners) have tried to find fault with the aforesaid evidence and they have pointed out some discrepancies between the statements of the witnesses, inter se, as well as with the allegations contained in the complaint. Those discrepancies are mentioned in the petition and they were also highlighted at the time of arguments. It was urged that under the above circumstances the allegations contained in the complaint as well as the statements of the witnesses be not believed and that on that ground alone the petition be accepted and the complaint pending in the court of the magistrate be dismissed. 13. In my opinion the discrepancies are not such as to make the statements of the witnesses unbelievable. The discrepancies are minor and these do exist on account of error of memory. (a) Where the allegations made in the complaint or the statements or the witnesses recorded in support of the same taken at their face value make out absolutely no case against the accused or the complaint does not disclose the essential ingredients of an offence which is alleged against the accused. (d) Where the complaint suffers from fundamental legal defects, such as want of sanction, or absence of a complaint by legally competent authority and the like." 15. In L.V. Jadhav v. Shankarrao Abasahad and others, 1983(2) RCR(Crl.) 400 (SC) : AIR 1983 S.C. 1219 same view was expressed. That authority is mentioned in paragraph 54 of the judgment of the Supreme Court in Pratibha Rani v. Suraj Kumar and another, 1985(1) RCR(Crl.) 539 (SC) : AIR 1985 SC 628. The judgement in 1976 SCR 123 was also followed in AIR 1985 SC 628 and the same is mentioned in paragraph 55 of the judgment. 16. It is clear from the above authorities that the High court can interfere only when either the complaint does not disclose the essential ingredients of any offence or there is no evidence to support those allegations. In the present case, the complaint does disclose the commission of offence and it is supported by evidence as already mentioned. Therefore, it can be said that the magistrate was justified in holding that there were sufficient grounds for proceeding against the petitioners. 17. The next contention of the learned counsel for the accused was that section 498A IPC came into force on 25th December, 1983, which was the date of Criminal Law (Second Amendment) Act, 1983, that the complainant even according to her allegations, had not been residing in the matrimonial home after 20th February, 1982, that therefore there could not be commission of any offence under section 498A IPC against her and that hence the accused could not be summoned in respect of commission of the said offence. 18. It is true that section 498A IPC was inserted by way of Criminal Law (Second Amendment) Act, 1983, which came into force on 25th December, 1983. It is therefore correct that anything done before 25th December, 1983 cannot constitute an offence punishable under section 498A IPC. But the allegations of the complainant are that she was being continuously threatened that her son would be taken away unless she met the demands of the accused by way of compelling her parents to sell their property in Hauz Qazi. Prima facie such threats come within the purview of the section 498A IPC which says that when the husband or the relative of a husband of a woman subject such woman to cruelty shall be punished with imprisonment for a term which may extend to three years and shall also be liable to fine. The word 'cruelty' is defined in the Explanation which, inter alia, says that harassment of a woman with a view to coerce her or any person related to her to meet any unlawful demand for any property or valuable security is cruelty. In the present case, as the allegations of the complainant are, she was harassed to meet the demands of the accused even by compelling her parents to sell their immovable property. That cruelty,as alleged by the complainant, was committed even uptil December, 1983 which was the date after coming into force of the criminal Law (Second Amendment) Act, 1983. 19. Learned counsel for the accused further contended that the offence under section 406 IPC is not made out at all because one of the essential ingredients, of demanding the Satridhan, for constituting that offence, was not in existence in the present case. It was submitted that in the present case there was no demand of the complainant from any of the accused the alleged jewellery and Satridhan of the complainant must be returned to her and that in that way, the present case was distinguishable from the case of Pratibha Rani (AIR 1958 SC 628). 20. The contention has no force. It is alleged in the complaint and also in the statement, as a witness of the complainant, that she was not given back her jewellery etc. inspite of her demand. Not only that, admittedly the complainant had even filed a suit for the recovery of her jewellery etc. or its value which is pending in the High Court. That means that the demand is being made consistently. But the accused do not want to return on the plea that they are not in possession of any part of the jewellery or alleged satridhan. Their aforesaid plea that they are not in possession of any part of the Satridhan will be gone into on merits by the trial court but the fact remains that there is a demand by the complainant. (a) Section 498A IPC gives an arbitrary power to the police as well as to the court thereby offending against the provision of Article 14 of the Constitution. The word 'cruelty' occurring in the said provision is very vague. It has been defined in the Explanation clause (b) of which says that if there is a harassment for obtaining some property or valuable security from a wife or her relative, it amounts to cruelty. The word 'harassment' is equally vague and as such any person can be arbitrarily hauled up for committing an act of harassment. (b) Section 498A IPC offends against the principle of 'double jeopardy' in as much as demand of dowry or any property is punishable both under section 4 of the Dowry Prohibition Act, 1961 as well as section 498A IPC. 22. In this respect the accused also made an application (Criminal Misc. 2230/85) to the effect that they had filed a writ petition before a Division Bench of this Court assailing the validity of section 498A IPC, that it was proper that this matter should also be sent to the said Division Bench so that the pronouncement in this respect may be authoritative. That application is also to be decided. That Criminal Writ Petition No. 2703 of 1985 was pending when the arguments concluded. However, on 16th January, 1986 the same was dismissed as withdrawn. The complainant filed an affidavit, dated 21st January 1986 in respect of dismissal of that writ petition. I called the file of that writ petition and found that the same had been dismissed as withdrawn on 16th January 1986, That being so, the aforesaid application does not survive and is liable to be dismissed as infructuous. 23. Considering the matter independently of the aforesaid application I am of the view that there is hardly any justification for referring the matter of validity of section 468A IPC to a larger bench. For the reasons which I am mentioning hereinafter there is hardly any force in this contention. The matter is simple one. 24. Section 498A IPC does not create any situation for double jeopardy. That provision is distinguishable from Section 4 of the Dowry Prohibition Act because in the latter mere demand of dowry is punishable and existence of electment of cruelty is not necessary. Section 498A IPC deals with aggravated form of the offence. It, inter alia, punishes such demands of property or valuable security from the wife or her relative as are coupled with cruelty, to her. Hence a person can be prosecuted in respect of both the offences punishable under section 4 of the Dowry Prohibition Act and section 498A IPC. It is just a case similar to section 5(2) of the Prevention of Corruption Act and section 409 IPC and in such a case it was held by the Supreme Court in State of Madhya Pradhesh v. Veerashwar Rao Agnihotri, AIR 1957 SC 592, that there could be no objection to a trial and conviction under section 409 IPC even if the accused had been acquitted of an offence under section 5(2) of the Prevention of Corruption Act and that Article 20(2) of the Constitution had not application. It may be mentioned that the said provision of the Constitution says that no person shall be prosecuted and punished for the same offence more than once. 25. There is no question of giving any arbitrary power to the police as well as to the courts. The word 'cruelty' is well defined and its import is well known. The import of word 'harassment' is also very well known and there cannot be any arbitrary exercise of power in interpreting that word. In fact many words occur in many provisions of law and they are to be interpreted by the courts. The power given to the court to interpret such words does not, in any way, mean giving an arbitrary power. In fact, wide discretions have been given to the court in the matter of interpretation of the words occurring in the laws and also in the matter of awarding punishment. If giving this discretion is thought to be conferring arbitrary powers on the courts, most of the provisions of law will have to be struck down as ultra vires. While discretion is given to punish a person for the same offence upto ten years it can be said that element of arbitrariness can creep in. But it is well established principle of law that such discretion cannot be said to be arbitrary and thus does not come into conflict with Article 14 of the Constitution. 26. Now I take up Criminal Misc. 2155/85. The present application is to the effect that the complainant in her preliminary evidence relied upon there letters, Ex. PW1/E, PW1/G and PW1/H, that it is contended on behalf of the complainant that demand of return of Satridhan was made in the said letters, that actually there is no demand and the hence copies of those letters be allowed to be placed on record. For the purpose of deciding the main petition i.e. Criminal Misc. (Main) 979/85 the entire evidence existing on the file of the trial court has to be taken into consideration. Under these circumstances the learned counsel for the parties were given opportunity to address in respect of these letters also. Hence this application is allowed. No further action is necessary Cr. Misc. 2155/85 stands disposed of. 27. Now I take up the criminal miscellaneous (main) No. 1222 of 1985. The learned counsel for the accused, inter alia, contended that this petition is not maintainable because the learned magistrate has yet to make up the mind in respect of framing charges after the entire evidence of the complainant has been led at that stage the complainant would be entitled to press that charges under sections 406 and 327 read with section 109 IPC be framed against all the accused. 28. There is no bar to the maintainability of the petition on the above ground. However, the application is useless at this stage because precharge evidence has to be led by the complainant in view of section 244 Cr.P.C. and either charge is to be framed of the accused or any one of them is to be discharged under sections 245 and 246 Cr.P.C. All the accused will be before the trial court and the court will have full discretion and liberty to frame any charge including the charges under sections 406 and 327 read with section 109 IPC or any other provision on the basis of the evidence produced before him by the complainant. 29. The learned counsel for the complainant stated that the petition had been filed by way of abundant precaution so that it might not be taken that the accused had been impliedly discharged in respect to the offences punishable under section 327 IPC and accused Nos. 3 and 4 had been implicitly discharged in respect of offence punishable under section 406 IPC. The apprehension of the learned counsel for the complainant in this respect is ill founded. There is no bar to the framing of any charge against any of the accused when the accused are before the trial court. In Thakur Ram and Others v. State of Bihar, AIR 1966 SC 911, the Supreme Court went to an extent that even if an express order of discharge was made by a magistrate in respect of an offence exclusively triable by a court of Sessions and a trial on the same facts for a minor offence was proceeded with, the magistrate had undoubted power to order his commitment in respect of the very offence regarding which he had passed the order of discharge, provided of course, the material before him justified such a course. 30. Under the above circumstances I dismiss both the petitions i.e. Criminal Misc. (Main) 979 of 1985 and Criminal Misc. (Main) 1222 of 1985. However, it is made clear that Criminal Misc. (Main) 1222/85 has been dismissed as unnecessary and the Magistrate shall have not only the power but shall be under a bounded duty to frame all charges of all the offences which are justified by the evidence led before him by the complainant. Those charges need not be confined only to the offences punishable under sections 498A, 406 and 327 IPC but charge of any other offence (e.g. one punishable under section 506 IPC in respect of threats issued to the complainant) which might prima facie appear from the aforesaid evidence of the complainant, can and shall be framed by the learned magistrate. 31. Criminal Misc. 2230/85 is also dismissed. The remaining application i.e. 2251/85 stands disposed of as mentioned already. 32. A copy of this order shall be sent to the learned magistrate concerned. 33. Criminal Misc. (Main) 979 and 1222 of 1985 stand disposed of.